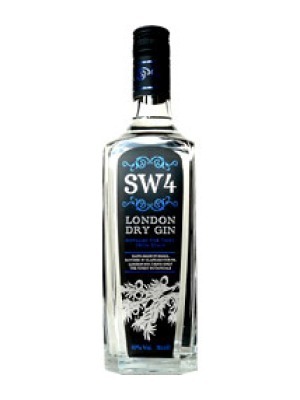 SW4 London Dry Gin is a popular Craft Gin available from TheDrinkShop in 70cl to buy online. Visit TheDrinkShop for the best price for 70cl of SW4 London Dry Gin or compare prices on our other Craft Gin products. A super-premium Gin for people who love to drink Gin with Tonic! SW4 is a small batch gin made in Clapham and has a unique recipe of 12 botanicals which combine to make the perfect Gin to mix with tonic. A contemporary distinctive bottle, makes this Gin stand out from the Gin crowd! SW4 London Distilled Gin, is a big and complex gin made in the style of the original London Dry Gins of the mid to late 19th Century. It has 12 botanicals in its recipe, with Juniper being heavily predominant, but then behind it come the citrus and spice notes, from botanicals such as lemon peel and cassia, which give it the fullness and complexity. Where to buy SW4 London Dry Gin ? SW4 London Dry Gin Supermarkets & Stockists. You can buy SW4 London Dry Gin online in most retailers and find it in the Craft Gin aisle in supermarkets but we found the best deals online for SW4 London Dry Gin in TheDrinkShop, Amazon.co.uk, and others. Compare the current price of SW4 London Dry Gin in 70cl size in the table of offers below. Simply click on the button to order SW4 London Dry Gin online now.